I love the piece! It is simple but elegant, definitely worth the investment! Since my anniversary band lost a diamond, I did not want to spend a lot of money. Then I saw this set on line and in a magazine. I was really excited about the price. When I did get it was WOW its so beautiful and the attention to the detail, I see why its done is sliver.Thank you so much. Wow what a beautiful ring. I don''t know what else to say about this ring it literally took my breath away. I kept looking at my finger and showed it to everyone. TheI center stone is larger than it looks and sits in a high setting which makes it look even larger. I just hope I''m not the only one that thinks it looks real, because of how large it is. It sparkles and shines and is just an amazing ring. I am using it as a wedding ring, my husband said I needed an upgrade lol. Most definatly a BIG upgrade. I never thought we could afford a ring like this and thanks to Staurer we can. This is a Beautiful ring. My husband just bought this for me for our wedding anniversary. It is gorgeous. It sparkles so much. This picture does it no justice. The center stone is huge, and the bands are thick. I am a very happy wife. I am floored on how beautiful this set is! It''s has the look of real diamonds at a fraction of the cost. I lost my wedding ring and bought this as a substitution. Let me just say that this is just as well-made and beautiful as my &quot;real&quot; diamond set! The Diamond Aura is amazing. I bought one for my wife 3 years ago and it still sparkles like new!!! As a test I took it to Kay Jewelers and asked them to give me there assessment on value, etc. Three jewelers looked at it and all agreed tey would value it at between $8-10k!!! They said the color was perfect, cut was clean and they were amazed. What stumped them more was when they put there diamond light to it and it was not reading it. I filled them in on what it was and they couldn''t believe it had stumped them, so to even an expert unless someone is walking around with a tester in there pocket they will never know it isnt a &quot;True&quot; diamond. On a side note my wife has had her hand literally grabbed by women in random places (we live in San Diego) to look at it. If you want something that is durable, not a $$$$ loss if it gets lost stolen or down the drain this is it. Hope this helps. Im going to get her another just because. Received many compliments on this ring set. Looks very expensive and has high refraction. Love it. I already own several Stauer items but this set impressed me. The rings are thicker than I expected and sit higher on the finger. They look great and wear very well. The stones sparkle and there is great detail on both bands. This is an impressive set and well worth the money! I saw this set in your catalog. Since we had a very small budget 28 yrs ago, my wedding set was very modest to say the least. I hinted to my husband several times about. I even put a sticky note on the picture with my ring size on it. He said nothing. On Christmas, he surprised me! It is much more beautiful than in the picture. The band is thicker than I am used to, but it is not bad. After wearing it a couple weeks now, I hardly notice it. The stones have so much sparkle. I absolutely love it. After seeing this wedding set in the esteemed Stauer catalog I left same, with the page and desired jewels marked, next to my husband''s computer. Suffice to say that NONE of the holiday lights or decorations in our area sparkled more than my eyes or the new stones on my left hand after I recieved this beautiful gift for Christmas! And even the trained eye has to look VERY closely to ascertain that these are not mined diamonds. Stunning! Well done, Stauer! I could not wait to get this set! I have been waiting for you to start making some and you have not disappointed me with this set. This is a solid well made set and seems to be holding up well to the daily treatment. My original wedding band was white gold and started cracking and warping after only 3 months of wear. I love the sterling silver rings because they hold up better. My husband got the pair for our first aniversary because my wedding band &quot;wasn''t worthy of me&quot;. He presented it over a glass of champagne at a candlelit dinner and I could see all the ladies on the surronding tables turning green when he placed it on my finger. The round diamond is so big and sparkling and the band design is just beautiful. I cannot help but smile when I glance to my rings. My husband of 15 years got this for me after I found it on Stauer''s website. I''ve been looking for a new wedding set and didn''t find anything I liked until I saw this. This is a beautiful set. The stones are so brilliant it sparkles even in low light. It is very elegant and vintage look and the center stone is very impressive. I am a very happy customer. Wow! Not only do these look exactly like they do in the photo, but they sparkle all the more! Bought these for my wife and she loves them. One thing that is a little added bonus is, although it is difficult to see, there are carvings in the band itself which matches the other band. The carvings are an elegant addition that is not easy to see on the website, but lovely up close! Beautiful ring set! Looks like a very expensive diamond engagement ring - the center stone is very large. The only thing that would give it away (other than you obviously being unable to afford a flawless 2 carat diamond ring) is that the band has ''Stauer'' printed on the inside, so if anyone looks at it, they''ll know where it comes from. It''s also very light-weight (b/c it''s made with sterling silver). I''ve been very impressed with my set!! :) Everyone where I work has ''oohh''d & aahhh''d'' over it since I got engaged! 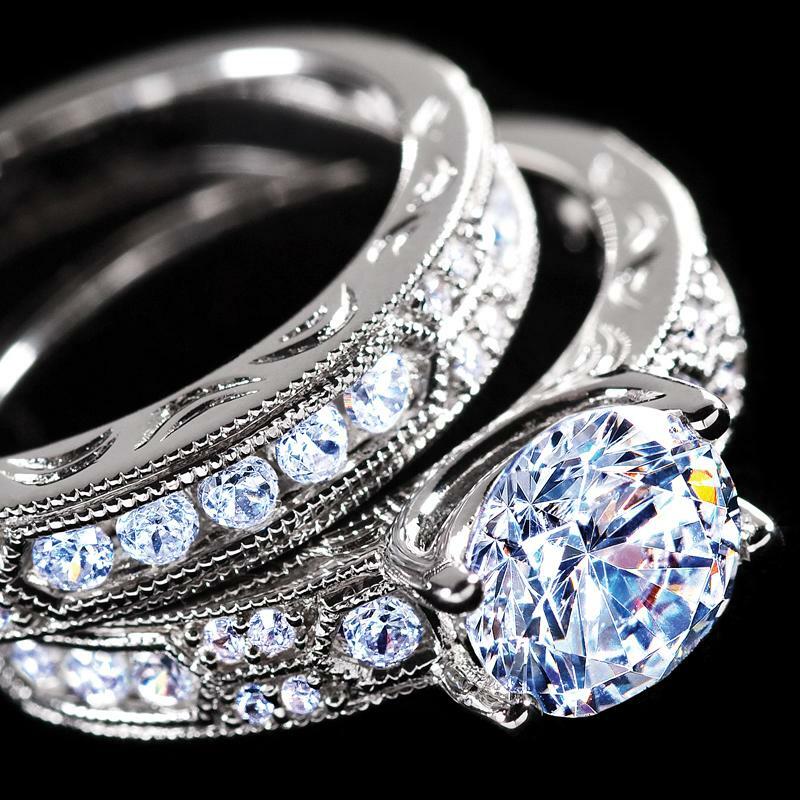 I really love these rings, they sparkle and look so real & expensive. I originally purchased another ring at Macy''s for $600.00 before I received the Stauer set. The Macy''s ring was returned after seeing & wearing the Stauer set. I have received so many compliments on such a beautiful wedding ring set! I am so glad I found out about this site and especially this ring. As I was searching this site I saw this one and knew it was what I wanted and was just stunned when I recieved it! The diamond is very big and sparkly, along with the band is also full of diamonds that just makes it shine, and I have had MANY people think it costs a fortune. Overall I am VERY impressed and smile everytime I look at it! I was a little nervous about ordering these rings. I did finally do it and I am so happy that I did. They are just beautiful. The diamonds sparkle with wonderful colors, and the carving on both rings makes them look vintage. It looks better than any diamonds I own. If you are skeptical about ordering, just do it! You will be delighted with the rings. When my husband got this ring set for me, last year, I''d gotten many compliments on it. Most ladies thought he''d spent over $1000, and were shocked when I told them hour much it actually cost. They may not be class A diamonds, but they are absolutely gorgeous and I LOVE THEM!!! I proposed to my fiance with this ring, seeing the joy and delight upon her eyes. To see this ring outside, you will see the full spectrum of the rainbow as the facets catch the rays of the light brilliantly. 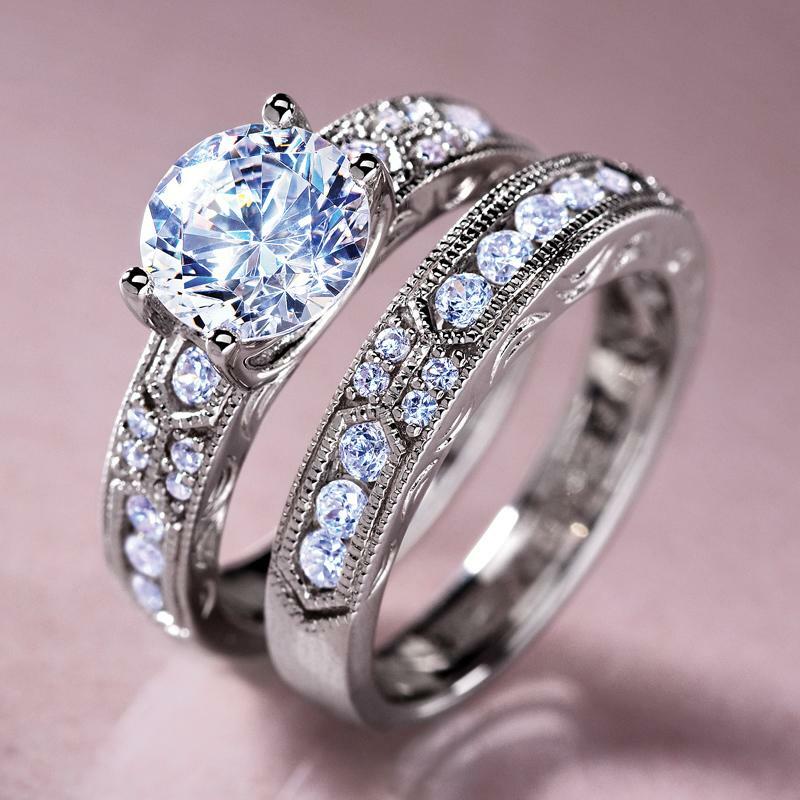 To trully see the full colors, place under a halogen bulb and see for yourself just how beautiful this ring trully is. Anyway, one day, she is in Manila, doing some shopping and was visiting a jewelerly store when the owner of the store kept looking at her ring. Since his stare was so obvious, my fiance asked if he would like to view it. He was most happy to do so, and upon examination, offered her pesos $100,000 (approx. $2,500) for her ring on the spot if she would like to sell it to him. Of course she declined, but she felt like a million bucks. Thank you Stauer for such a beautiful ring that makes people from around the world second guess themselves. P.s.-I haven't the heart to tell her the true value of her ring. She still does not know. It is unique and still just as beautiful, one year later. Thank you so much for this beauty that I proudly wear; firstly because I am honored to be married to the most awesome man on earth, and secondly because it is just a gorgeous ring that I feel perfectly symbolizes our beautiful love and union! I received this set for my 21st wedding anniv.I must say,it is so beautiful ; absolutely stunning & just as prescious to me,as my original gold band which hy husband had inscribed 21 years ago. I wear my jewelyry EVERY day & am very hard on my rings in particular,but I truly believe *and it has so far* ,this set will last for a very long time,hopefully long enough for my granddaughter to enjoy! I know this will not be our last purchase from Stauer. I also received another single ring for xmas. Love Love,Love them! excellent quality & receive many compliments on a daily basis! I JUST RECEIVED THIS SET- I ALWAYS WANTED TO TRY IT. IT IS VERY BEAUTIFUL INDEED. AND MOST REALISTIC SIZED. LOVE THESE WELL MADE RINGS--THEY FEEL SO WELL ON MY HAND THAT I ANT EVEN TELL THEY ARE ON MY FINGER ! OK, I BOUGHT THIS RING SET FOR MY BEST FRIEND FOR CHRISTMAS, SHE WAS SPEECHLESS AND HER MISTY EYES SHOWED ME MORE THAN WORDS-MY SECRET THO IS THAT I DID TRY THEM ON AND CONFESS THAT I DID THEM FOR THE DAY-THEN THOUGHT I MIGHT JUST KEEP THEM FOR MYSELF--LOVED THEM ACTUALLY ! It's a stunner for sure!! I just received this beautiful engagement ring from my now fiancé. I'll be honest - I wanted a ROCK, a real stunner. But at this point in our lives, why waste money on a real diamond when you can find such a beautiful replacement. This ring is a stunner to be sure. The sparkle in certain lighting and the sunlight - WOW! I've gotten several envious comments like, "That's my goal, to have a ring like that." My husband gave me this set 6 years ago and it still is so beautiful! For the price, it is exceptionally lovely! I clean it every couple days with Tarnex or Windex and it shines brilliantly. I am so very happy with these rings! My husband bought this for me when my other ring lost the diamond. I wear my rings all the time! To this day, even being bumped, scratched and other abuse, it has stayed in place and kept its shininess. Very strong diamond. Looks great on and I get lots of compliments on it. Very good buy!!!! Marriage is not a wedding. Or a honeymoon. Or even a Golden Anniversary. Marriage is a journey that you take one day at a time. It's a road with ups, downs and plenty of curves along the way. We don't always know what lies ahead, but we have plenty of ways to keep things interesting. Learn to tango. Head south for the weekend. Or just take her breath away with a tiny box. 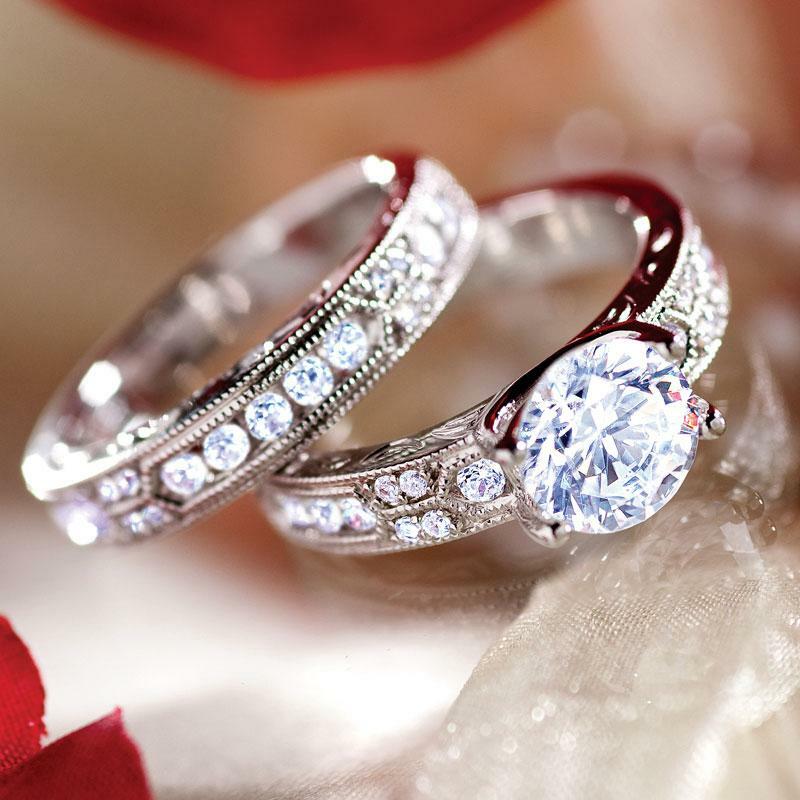 We've definitely designed the DiamondAura® Dearly Beloved Rings Set with matrimony in mind. The engagement ring captures the rush of romance with a dramatic DiamondAura centerpiece and the ornate shoulders are set with smaller, brilliant rounds. Set in an exquisitely-detailed sterling silver band, the brilliant, 2-carat round-cut sparkles with even more fire and clarity than a "D" flawless natural diamond. The loving couple is made complete with an equally stunning wedding band, lavished with channel-set, lab-created DiamondAura in an elegant band lush with vintage-inspired detail. Both rings in the set are the same size. They cannot be mixed as different sizes.